Attending a conference abroad (or even overseas) can be a good opportunity for a little holiday with the dearest ones. Yet, unfortunately, seldom they are interested in the most intriguing aspects of the latest advances of our beloved technologies to join the conference auditorium! Also, how to enjoy evenings or few pre- or post-conference days in the hosting town? Prague is a renown tourist destination, so any visitor can easily find hosts of convenient guides in any self-respecting bookstore or on Internet. Let us here, however, share few bits of local knowledge and suggest some lesser known options for Prague leisure time hours and days. Discussion to this post is open for everyone: please do not hesitate to ask for details, specific tips or to share your ideas! This paragraph refers to 2014 winter. Yeah… weather is crazy this winter. Not like two year ago, when temperatures felt to -20°C (-5°F) — even Russian taxi drivers complained that it was cold here! This year we can count days with freezing on fingers on one hand so far. It may well happen that temperatures rise up to 10°C (50°F) 15°C (60°F) on sunny afternoons! For reliable weather forecast, check e.g. this Norwegian site: yr.no. ☼ Žizkov tower: the modern tower — not so far from the conference venue — has a visitors platform where you can overview the whole city, inspect nearby block backyards as well as to see most of the country, actually! Google map. If you are there, walk to the neaby Jiřího z Poděbrad square with the Church of the Most Sacred Heart of Our Lord, build in ’30 by architect Josip Plečnik. ☼ Kubista (The Cubist) is a gallery and design gift shop situated in a century old Black Madonna’s house, build in Cubist style. You can also get architectonic guides to Prague there – featuring Cubist or Art Nouveau buildings around the downtown. Google map. 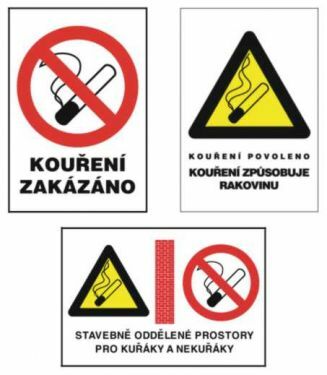 The third symbols means that the establisment is mixed: then smokers’ and non-smokers’ areas must be separated by a “permanent structure”. ☼ Čestr: the best beef in the town. The restaurant name is an abbreviation for Czech Fleckvieh breed. Table booking in advance is almost the must. The restaurant itself is in walking distance to the conference venue, and is situated in one of the most controversial buildings in Prague: the former Federal assembly of the late Czechoslovakia, an engineering masterwork by Karel Prager, the architect that by his brutally autistic monumental buildings irrevocably changed Prague’s face in the second half of the last century. Google map. ☼ Lokál: one of the best beers in Prague. In a side street near the famous Charles Bridge. Offers excellent beer, plus good selection of Czech cuisine. Not quite a “local pub,” yet not a touristy place either. Google map. ☼ Tea-houses: although in middle of the world list of per capita tea consumption, Czechs grow tea gourmets during the last decades, and good loose leaf tea become part of local lifestyle. So are tea-houses that offer dozens of tea varieties from all around the World in ambient environment. One of the first, and best, tea-houses, Dobrá čajovna is directly in a back-yard on Wenceslas Square No. 14. Another one, U Zlatého kohouta (Golden Rooster’s), is in another quiet back-yard of an eponymous medieval house in Old Town. ☼ Yeah, Starbucks is in Prague, too. But if you fancy something more… like coffee, maybe one of Mamacoffee’s cafés is the place. E.g., in Londýnská str, on Korunní str, or in Vodičkova. ☼ U Staré studny: they offer carefully selected Moravian wines; yet their main speciality is imported cognacs and armanacs by boutique French producers, and some lesser known yet excellent French wines from Gascony area. Ask also for home-made pralines and pâté. A hidden gem. Google map. ☼ Veltlín: named by Grüner veltliner wine variety, this bar serves only wines produced on the territory of the late Austrian Empire. Their speciality is authentic (natural) wines, made in small quantities using traditional techniques. Google map. The surrounding area, Karlín, a traditional downtown working men district, was heavily hit by 2002 floods, and is steadily rebuild into one of business and service centers of Prague, full of cafés and restaurants to serve legions of young white collar workers. ☼ Hipsters! There is no other way around but to visit Krymská street in the bohemian district of Vršovice. ☼ Karšlejn is THE touristy place, yet it is worth visit, also for the landscape and nature that surround it. Instead of using a bus coach trips offered at stalls through the downtown, go there by train. There is regular connection there from the Main station, about every hour through the day. The journey is about 40 minutes each direction, and goes via a river valley along Brdy hills. You can also interrupt the journey in any stop (train tickets allow for it) to walk part of the route, or just to visit one of the towns along the route (Řevnice, Dobřichovice, Černošice) to have lunch, coffee or a beer there. Google map. If you like hiking, you can also start at Karlštejn and follow the red marked path back towards Prague (to end up e.g., in Lety MMX brewery for dinner before dispatching back to the city by train). ☼ The third most creepy place on the Earth: Sedlec Ossuary. Google map with photos, a photoblog post. Nearby town of Kutná hora is not creepy at all and has a beautiful cathedral and a museum that features medieval silver mines – once the ultimate source of the wealth of the Kingdom of Bohemia. Direct train connection from Prague, too. Google map with photos, another photoblog post.